Cincinnati, OH (Oct.1, 2016) – Robomotive Laboratories is changing the way the world sees robotics with the introduction of their transformative new robot, mimic. 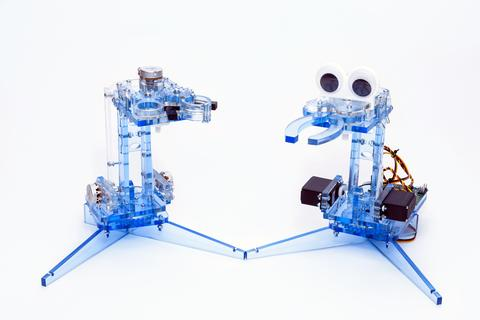 Today, the Cincinnati-based small family business launched a new Kickstarter campaign (https://www.kickstarter.com/projects/713401305/mimic-immersion-robot) to help advance the development and production of the new technology. 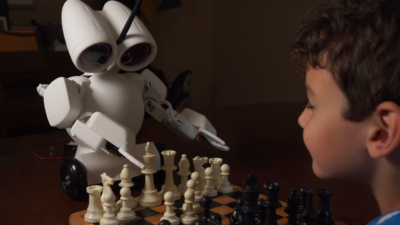 Mimic represents a technological breakthrough in the way people interact with a robot. 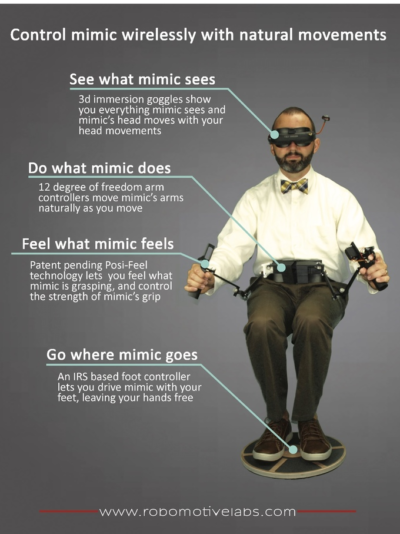 Through a series of interfaces and controls, the user is transported and able to see what mimic sees, do what mimic does, feel what mimic feels, and go where mimic goes. The key to bringing mimic to life is the mimic arm controller with patent-pending Posi-Feel grip controllers. 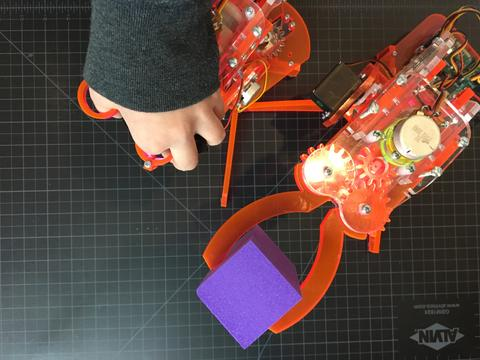 The user wears a device that allows the seamless control of mimic’s arms and grippers by moving his or her own hands and arms in natural ways while holding two simple handles with trigger style grip controllers. 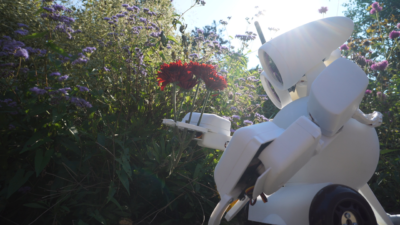 A series of joints, pivots and sensors are built onto the mimic Arm Controller to make this possible. Mimic can also move around on its own power, controlled by the user with an IRS based foot controller. The user places both feet on the controller and tilts the device forward, back, left, or right to command mimic’s movements in natural, hands free ways. To complete the user’s sense of immersion, immersion goggles receive 3D video from a pair of cameras in mimic’s eyes. 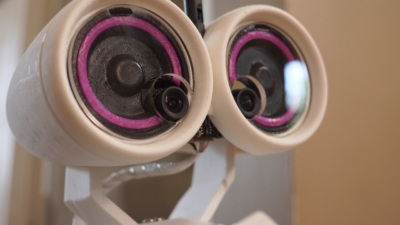 Not only does the user see what mimic sees in vibrant 3D, but using a series of sensors and motors the user’s head motion is duplicated by mimic’s head, allowing the user to change view by simply moving his or her head. Robomotive Laboratories realized early that a single version of the mimic robot would not fit all users needs, so backers have a choice of four versions of the robot, each design with a different use in mind. The mimic:maker version comes in kit form for the user to assemble. 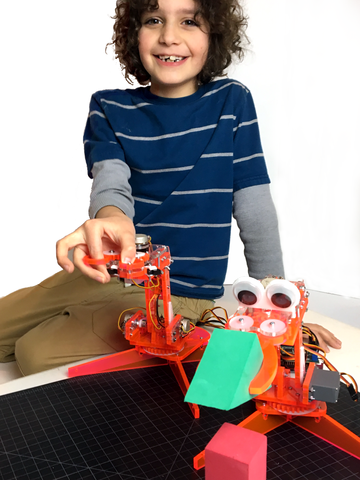 The kit includes a robot with two arms and grippers, as well as a mimic arm controller. 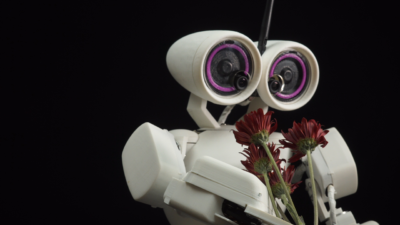 The kit does not include a body, however, so the user can tailor the robot to their needs or to make something new. For even more flexibility, all the electronic inputs and outputs are exposed to be manipulated or utilized by the user, including record and playback through an on board SD card. „The future is being invented in basements, garages, and maker spaces all over the world. That’s where mimic was born, and mimic:maker is a chance for other tinkerers to use and improve it,“ says Pipitone. 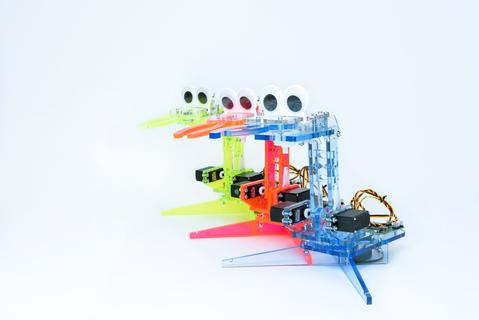 For more information, please visit: http://www.robomotivelabs.com/.